The International Academy of Estate and Trust Laws (IAETL) meets each May to spend a week of intensive engagement with issues of direct and immediate concern to estate and trusts lawyers. More than merely an assembly of commentators and interpreters, the IAETL is a prestigious body that affects real change in courts, law reform commissions, and governmental agencies. Its membership¿including solicitors, barristers, notaires, judges, and scholars, all experts in trusts, estates, and inheritance law, and/or tax law¿highlight the contrasts and comparisons between the pertinent laws of civil and common law jurisdictions. how best to serve the client at the same time as meeting one¿s ethical obligations. As always, this outstanding annual (the fourth in this series published by Kluwer Law International) continues to offer perspectives that open on ideas in themselves, apart from the demands and responsibilities of knowing and applying the law in busy demanding professional and scholarly environments. For this reason especially it is sure to engage the deep interest of researchers, academics, practitioners, law reform bodies, governmental groups and their advisers working in this complex and varied field of law. Presidential Foreword; R. Moyse. Editor¿s Preface; R. F. Atherton. Notes on Authors. Part I: Trusts and Taxes Italian Style. Introduction. Trusts¿Some Observations from a Civil Law Perspective; M. Lupoi. Trusts and Company Law¿the Italian Experience; E. Andreoli. Trusts and Income Taxes in Italy; G. Maisto. Analysis of Indirect Taxation on Transfers of Trust Property in Italy; P. Gaeta. Part II: Death and Gift Taxes including Cross-Border Issues. Introduction¿Overview and Comparative Reflections; Hon. I. V. Gzell. Special Considerations in US-Canada Estate Planning; W. D. Goodman. Inheritance and Gift Taxes¿France; L. G. Chambaz. Death and Gift Taxes¿A View from Switzerland; R. F.G. Pease. Death and Gift Taxes¿United States; E. J. Stapper. Part III: Debate¿Should Utopia Introduce an Inheritance Tax? Introduction. To Tax or Not To Tax¿That was the Debate; B. R. Hauser. Estate Tax¿ An Argument in Favor of Working Toward Equality, Justice and Common Sense through a System of Estate Taxation; J. Kartiganer, M. Sedlaczek. Death Taxes: Unfair and Inefficient; T. G. Youdan. Death Taxes for Utopia? A Case in the Negative; J. Killius. Part IV: Ethical Issues in Estate Planning. Introduction; B. S. Ross. 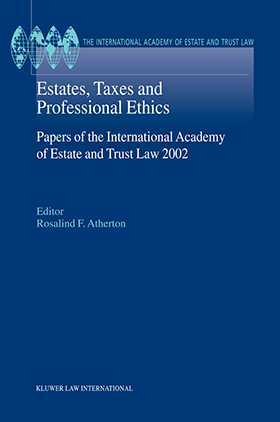 Ethical Guidelines for the Estates and Trusts Lawyer: The ACTEC Commentaries on the Model Rules of Professional Conduct and Notes on Ethics 2000; B. S. Ross. Conflict of Interest and Professional Obligations in Estate and Trust Law¿An English Perspective; M. Jacobs. Conflict of Interest and Professional Obligations in Probate Actions in Germany; A. Frieser. Rules of Conduct for Estate Planners and Ethical Issues in Estate Planning Practice in The Netherlands; H. M. Sasse. Index.